How To Spot A Fake Rolex | Watchfinder & Co.
We all know the scene—you pass a dodgy market stall down a back alley, when suddenly the guy manning it pulls out a drawer to reveal a surplus of what appear to be luxury Swiss timepieces. With just the smallest amount of scrutiny, though, it becomes apparent that there’s nothing luxury about those watches at all. It used to be that spotting an imitation watch was this easy—but the game of making a fake has changed, with counterfeiters using increasingly sophisticated machines and technology to craft timepieces as close to the originals as possible. Modern day imitation watches are becoming harder to recognise without a trained eye—so how can you be sure that you’re buying the real deal? We take you through a few steps that might help you spot a fake. The Rolex Submariner holds the dubious honour of being the most copied watch worldwide, so it’s a good frame of reference to start from. 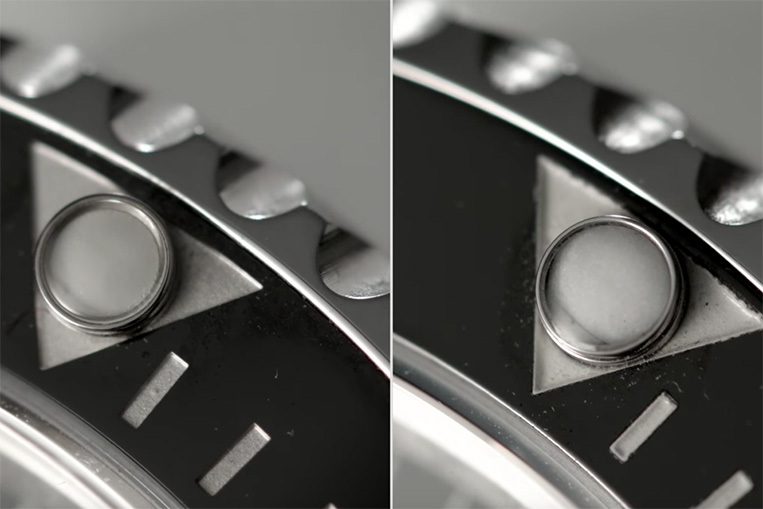 Held up next to an imitation, the differences between the real Submariner 116610LN and the fake are incredibly subtle, and more often than not, high magnification is needed to see them. Overall, a good rule of thumb is that the fake watch won’t be finished with nearly the same attention to detail as the genuine Submariner. 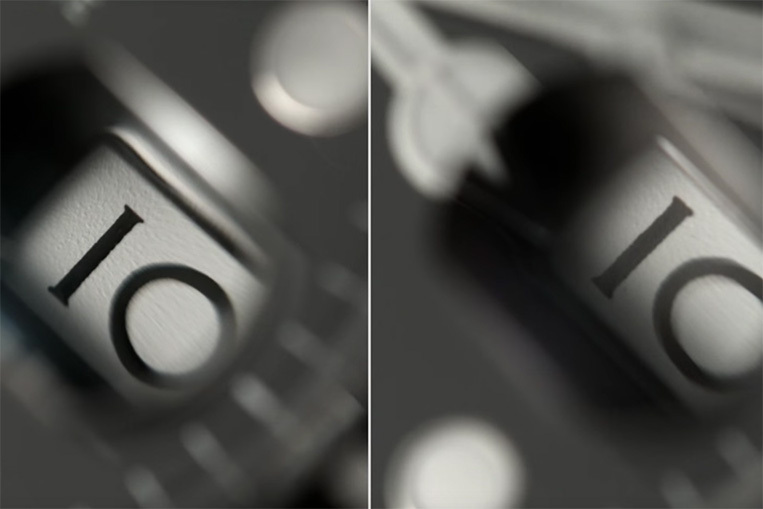 The cases, for example, appear to have extremely similar polished and brushed finishes—but the lettering between the fake watch’s lugs give the game away, featuring much rougher engraving. Looking closely at the machining of parts likes the crown will also reveal the work to be irregular and less refined. It’s also important to keep an eye out for the little details. 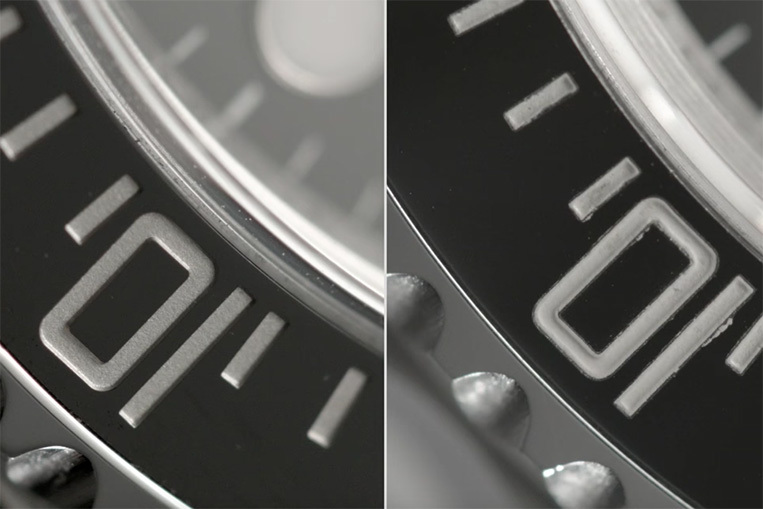 Closely examining the counterfeit, you can see that the lume on the bezel markings is slightly dimmer, and the colour of the pips slightly whiter. No expense is spared at Swiss workshops to achieve exceptional quality, so the numbers on the real bezel are applied in platinum via a time-consuming and expensive PVD process. The fake, meanwhile, has painted numbers that, under high magnification, are revealed to be uneven and raised. 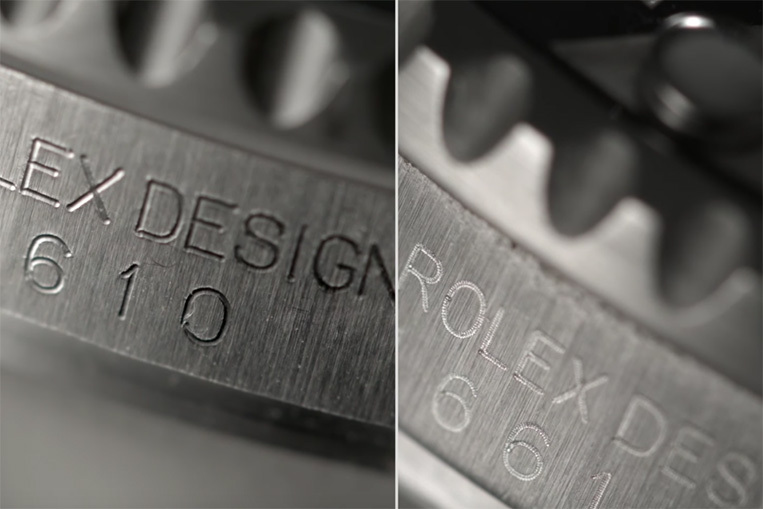 The counterfeiters go to extreme lengths to fool the consumer, even going so far as to inscribe Rolex’s signature laser-cut crown on the glass; with the naked eye, it doesn’t appear much different, but magnification uncovers the sloppy nature of the imitation’s etching. The font, too, is remarkably similar in print quality; it only falls down on the wider spacing between characters and the comparative thinness of the letters, making them appear greyer and less crisp. Probably the biggest giveaway on the dial is the date wheel; the numbers are not as centred on the fake and the print quality not as good, while the magnifying window is not only coarser than the original, but features a bluer anti-reflective tint. Of course, the biggest tell comes when you look inside the watch. The true Submariner has the Rolex calibre 3135 beating at its heart, whereas the imitation has a fake ETA 2824. 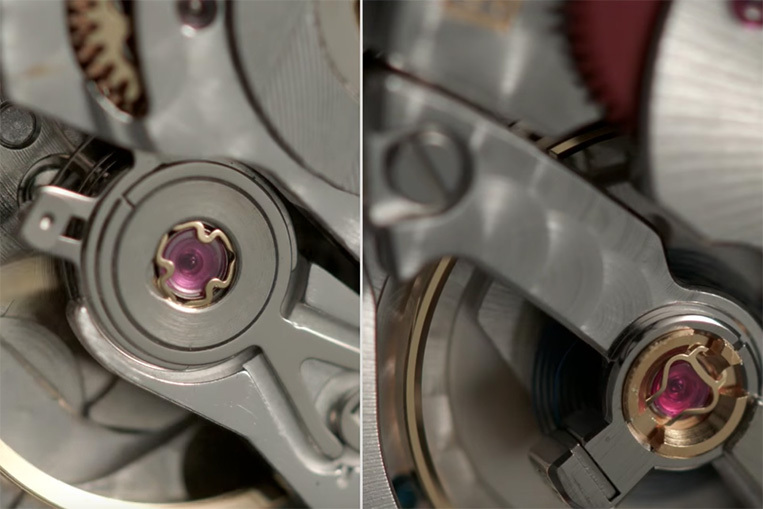 The imitation movement is a reasonable copy of the 2824, but it can’t match up to genuine Rolex engineering. There’s nothing quite like Swiss craftsmanship, but that’s not to say that counterfeiters aren’t doing their damnedest to make it hard to identify genuine from imitation. It takes a keen inspection to tell one from the other, which is why Watchfinder watchmakers are manufacture accredited to handle authentic timepieces, and highly trained to spot the fraudulent copies of them. Going to a brand-certified retailer is the best way to avoid the pitfalls of buying a fake watch, giving you peace of mind that the Rolex on your wrist is exactly what you think it is.